FLAC Splitter: How to Split FLAC CUE and Split FLAC Files Freely? If so, you are definitely in the right place. The article is going to introduce a powerful FLAC CUE Splitter. At the same time, there will be a step by step guide on how to split FLAC CUE files with this ideal FLAC Splitter. Unlike just having PC FLAC Splitter in the software market, this FLAC CUE Splitter has both Windows and Mac version. The ideal FLAC File Splitter can split FLAC CUE files without changing FLAC file format. Of course, it can split FLAC files to convert FLAC to MP3, WAV, WMA, M4A, AIFF, ALAC, OGG etc. if you have such needs. You can also convert FLAC CUE files in batch so that you are no longer troubled by waiting for converting files one by one. Besides splitting FLAC CUE files, this powerful FLAC CUE Splitter also supports split MP4 files, split MKV files, split MOV files, split FLV files, split AVI files, split MP3 CUE files, split APE CUE files, split WAV CUE, split M4A CUE files, split OGG CUE files, split MPC files, split WTV, WMV, AVCHD, VOB, MPEG, Xvid, DivX, 3GP, MOV, F4V, Apple ProRes MOV, WebM, AAC, AIFF, AU, RA, AC3 etc. In addition, the good FLAC CUE Splitter is also an all-in-one video converter which can convert among more than 168 video and audio formats like convert FLC files, convert FLI files, convert MOV to Windows Movie Maker, convert among MP4, AVI, FLV, WTV, WMV, AVCHD , VOB, MKV, EVC/H.265, Xvid, DivX, H.264, 3GP, MOV, F4V, WebM, VP8, VP9, MP3, AIFFL ALAC, AAC, AC3, WAV, WMA, FLAC and etc. with high quality. Furthermore, FLAC Splitter has some video and audio editing functions like combine files together, cut the unwished files, increase audio volume, and adjust bitrate and resolution and more. Last but not least, FLAC File Splitter features to download videos from YouTube. Just add the URL to the software and it can help you enjoy YouTube videos easily. How to Split FLAC Files with FLAC CUE Splitter? Be Ready: Free download FLAC Splitter (Windows Version, Mac Version). Install and launch the program. Click “Add File” to load FLAC audios. You can also simply drag and drop the files to the main interface of the software. If you want to split FLAC CUE and keep FLAC as the output format, click “Profile” drop-down button to select FLAC as the output format. 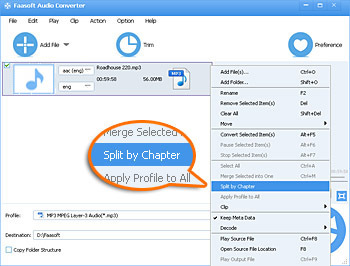 Then right click and find “Split by Chapter” from the context menu, the CUE file associated FLAC will be automatically cut to individual tracks with its original track name. If you need to split FLAC files and convert FLAC to other formats, click “Profile” drop-down button to choose the format you want. Then also right click and go to “Split by Chapter” from the context menu to split files for converting. Note: You may also go to “Trim” “Settings …” window to cut videos, crop videos, compress files, increase videos quality/ sound volume, adjust video or audio channel or codec and more. Click “Convert” button to start splitting and converting FLAC CUE files. When the conversion is done, click “Open Folder” button to get the converted files and start enjoying your files. It is a piece of cake to split FLAC CUE files with FLAC Splitter. Why not get FLAC CUE Splitter to start enjoying now? Medieval CUE Splitter: Split a single big audio file like an album or a compilation into independent audio tracks by .cue file. However, it only has PC version and can only split files without decoding. Free CUE Splitter: A free splitter. However, it can just split files only based on CUE files. The conversion speed is quite slow. This entry was posted in Audios and tagged flac cue splitter, flac file splitter, flac splitter, how to split flac files, split flac cue, split flac file, split flac files. Bookmark the permalink.